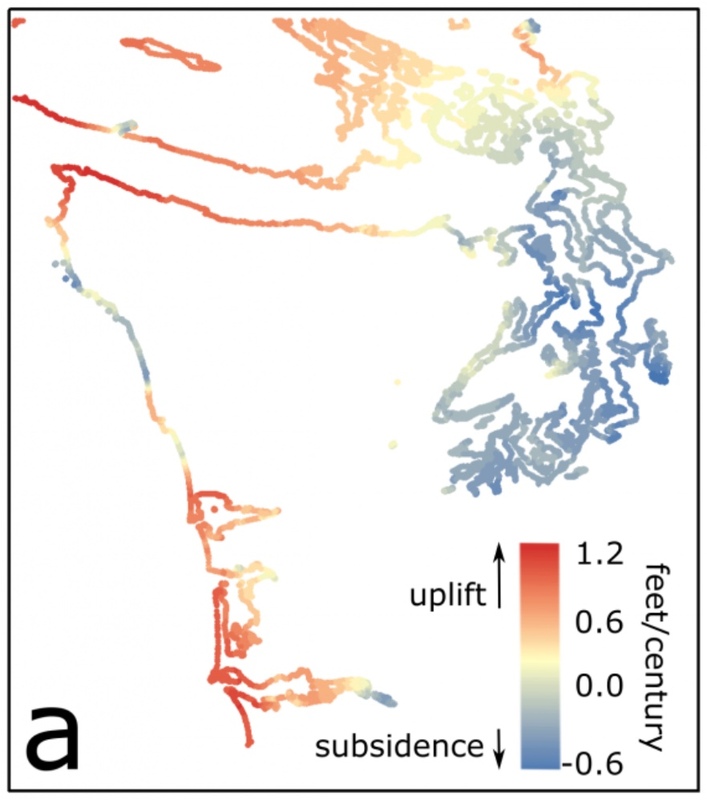 The result is a prediction of sea-level rise at 171 locations, covering every shoreline in Washington state — as opposed to more general predictions made in previous studies, including regional and national studies by others. The goal this time, Ian told me, was to develop an analysis that could be used for predicting future high tides at any shoreline segment in the state. Actual sea-level rise will depend on how much humans can reduce greenhouse gases in the coming years and other factors. Results in the report are given for both high and low scenarios based on climate models, and the findings are presented as probabilities of occurrence. In Bremerton, for example, the analysis predicts that there is a 90 percent chance that the sea level will rise by 6 inches or more by 2070. At the same time, the probability is 50 percent that the rise will be at least 1 foot by 2070 and 10 percent that it will reach 1.7 feet by that year. That’s under the low greenhouse gas scenario. Under the high scenario, there is a 90 percent chance that the sea level in Bremerton will reach 7 inches by 2070, a 50 percent chance that it will reach 1.2 feet and a 10 percent change that it will reach 1.9 feet. In some cases, a rise in the high tide level by just 6 inches can result in serious property damage, especially if winds and waves increase as a result of more intense storms. 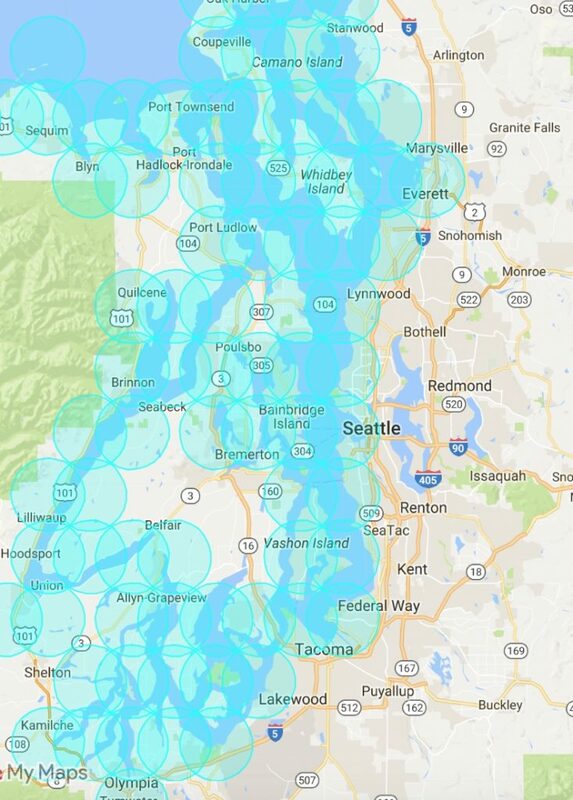 For Bremerton, there is a 16 percent chance that this level will be reached by 2030, a 50 percent chance it will be reached by 2040 and a 75 percent chance it will be reached by 2050, according to the report. Clicking on the map at the top of this page will take you to the online interactive map. Looking at the online map, click on any shoreline location to download the data tables, which may look a little intimidating at first. But don’t worry. Just use the tabs at the bottom to pick a high (RCP 8.5) or low (RCP 4.5) greenhouse gas scenario. You will see two tables for each scenario. In the top table, pick a year (vertical list) and a probability (horizontal list) to get the projected sea level rise (in feet). In the bottom table, pick a year along with sea level rise to get the probability of that level being reached. Sea-level rise is accelerating as time goes on, as predicted by climate models and supported by recent studies. (See the report on satellite readings in the Proceedings of the National Academy of Sciences.) One hundred years from now, there is a 90 percent chance that sea level will be at least one foot higher in Central Puget Sound and a 50 percent chance that it will be at least two feet higher. Unlike any previous report in Washington, predictions for changes in vertical land movement in the new report are based on three different sources of information: variations in tide gauges, “leveling surveys” used by highway engineers and data from continuous global positioning satellites. For the satellite data, the analysis of sea-level rise took into account separate assessments of land movement calculated by five different organizations. 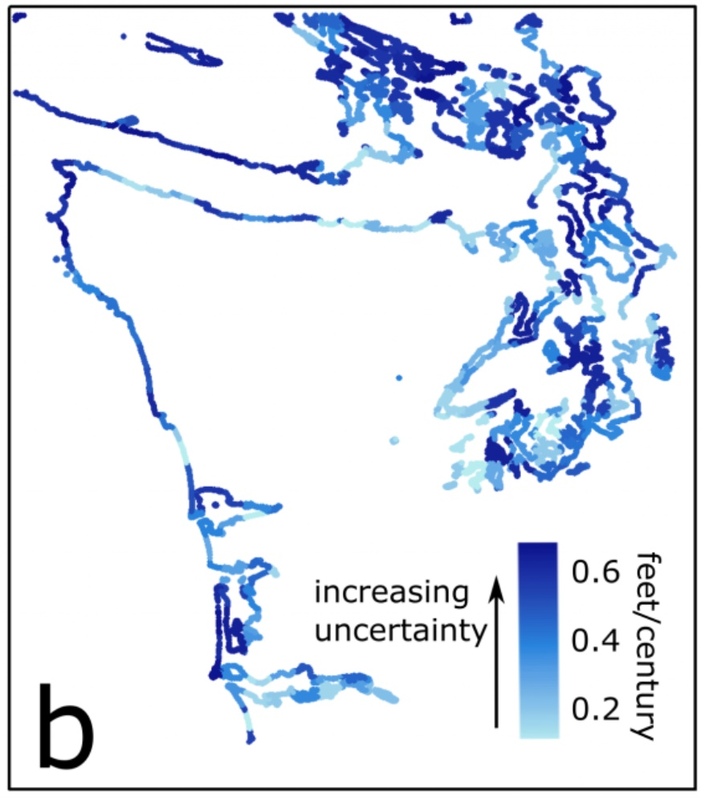 By analyzing the sources of data for vertical changes across the landscape, the researchers were able to provide a range of uncertainty for each of their 171 shoreline locations. Knowing the level of confidence for water reaching a given level in a specified amount of time can help people decide whether they are willing to accept the risk or begin planning for the future. I’ve gone through the map, looking at a variety of waterfront locations in Washington state. In the lists below, I’ve grouped the cities to show how much the sea level is expected to rise by 2050, using a 50 percent probability and a high greenhouse gas scenario.